Personalization is key to engagement and conversion in today’s big data-driven marketing environment. Messages tailored to a user’s real-time behavior, interests, and personal preferences will resonate with consumers and business buyers alike, and they improve customer experiences and response rates. Brands offering personalization will outperform those that don’t by more than 15 percent by 2018, according to Gartner. Live chat apps are growing in popularity and can be used to facilitate deeper, personalized engagement with customers, and yet marketers seem slow to adopt this fast-growing channel. Why aren’t more marketers putting mobile-first messaging to work to reach and engage their audiences through chat? Marketing is not just about insight, but the ability to use that insight to create change within teams and throughout organizations. “I think we’re at a point where the challenge isn’t perfecting the technology or unifying our data. The real challenge now is human,” said Stefan Tornquist, VP of research at Econsultancy. The chat messaging opportunity is only growing, and marketers could be using these real-time tools themselves to communicate with their own colleagues across siloed company divisions at every stage of their customer’s buying cycle—from inventory levels on the factory floor and customer support on the phone to the shipping department. Retail customer experience is an obvious use case for this technology. Thanks to companies like Amazon, today’s customers expect personalization at nearly every touchpoint. They want a retailer to know their interests: what size, color, or style they typically buy, or what they looked at last time they were in the store. Many businesses are leveraging data to deliver this type of experience to their customers across their marketing campaigns, but chat can help take personalization one step further by allowing agents to connect directly with customers in real time while they’re actually in the purchase process. According to the Wall Street Journal, large retailers such as Zulily and Everlane (and even airline KLM) plan to use Facebook Messenger this year to deliver enhanced customer service, while large, omni-channel retailers like Walmart and Nordstrom are already onboard. The benefits for customers and businesses alike are potentially substantial, particularly when customer service representatives have access to CRM data. Prospects get the responses they need quickly, while customer service and sales teams can take advantage of chat interfaces to address multiple conversations easily. This speed and ease is a clear advantage over email; being overwhelmed by inbox messages doesn’t happen with chat. 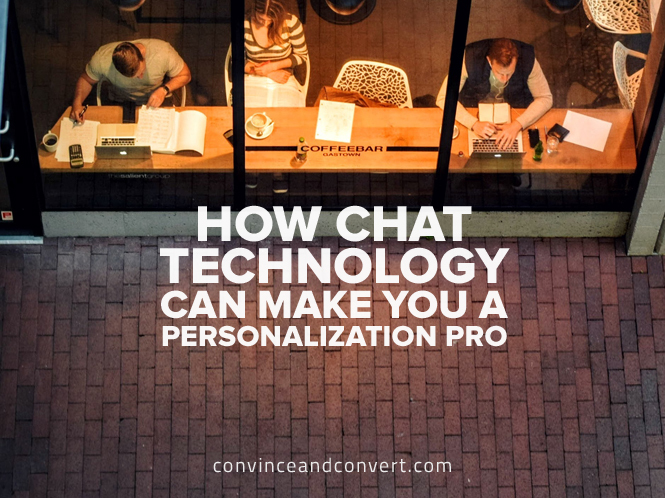 Because chat apps are multi-user, agents can see when someone else has addressed a customer question, which not only eliminates clutter, but also eliminates duplication of efforts. While many adults in the Western Hemisphere aren’t familiar with chat beyond texting or Facebook Messenger, it’s really simple to use and accessible from both mobile and desktop devices. From a business perspective, the same advantages apply. As more customers shop with mobile devices, mobile-based customer service and sales options will become increasingly important. A recent study showed that companies using online chat services boasted a 19 percent increase in order value. Even more compelling, 88 percent of shoppers in the study would have abandoned their carts without a “click to call” or “click to chat” option for support. While the use cases for live chat with consumers are clear, there are also internal uses for chat that can help improve the customer experience and make it even more personal. For higher-ticket sales items, such as cars or major appliances, customer service can bring more seasoned sales team members into the chat to engage in consultative discussions. These team members can even share brochures, spec sheets, or comparison charts within the chat application. Whiteflash.com, an online diamond retailer, has trained three gemologists available to join live chats. The company has seen its average order value increase by 67 percent since introducing chat. In the event that an item is out of stock, customer service representatives can use chat to reach other teams within the organization—even in remote warehouses—to determine when inventory will be replenished. They can even arrange for shipping to the store or the customer directly. Because chat enables marketing professionals to engage customers during the sales process, it provides new insights into how customers shop. This can help improve marketing, better align the marketing and sales teams, and prepare customer service representatives to engage customers and guide them through conversion. Marketers should be viewing chat as an exciting new tool to differentiate their brand and delight customers. Its ability to keep customers engaged while increasing sales should not be overlooked for internal or client-facing uses. As the Founder and CEO, Toshi Yamamoto oversees the day-to-day operations of ChatWork, a group chat app that helps over 100,000 companies across 205 countries and regions communicate, collaborate, and increase productivity. Founded in 2004, ChatWork is Asia’s No. 1 business chat app. ChatWork is based in Osaka, Japan with employees located in Asia and the U.S.